If you have exactly 4 Fairy-Type monsters in your Graveyard, you can Special Summon this card from your hand. When you do, add 1 Fairy-Type monster from your Graveyard to your hand. Neither player can..
Activate only if all face-up monsters you control are "Fortune Lady" monsters. Negate the activation of a Spell or Trap Card, or the Normal summon of a monster, and remove that card from play. The car..
1 Tuner + 1 or more non-Tuner Gemini Monsters. Once per turn, you can send 1 Gemini Monster from your hand to the Graveyard and destroy 1 Spell or Trap Card your opponent controls. 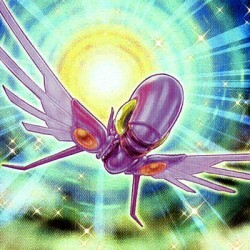 When this card is d..
You are unaffected by the effects of "Clear World". If this card attacks an opponent's monster, the ATK of this card becomes twice the ATK of the attack target, during damage calculation only. If this..
During each of your End Phases, pay 500 Life Points or destroy this card. Each player receives certain effects, depending on the monster Attributes they control. - LIGHT: Play with your hand revealed .. While this card is face-up on the field its Attribute is also treated as WIND. You can remove from play 1 DARK monster and 1 WIND monster from your Graveyard to Special Summon this card from your hand.. This card can only be Ritual Summoned with the Ritual Spell Card, "Ritual of Grace". When this card is Ritual Summoned, select a number of face-up cards on the field (except this card), up to the numb.. When you Ritual Summon a Ritual Monster, you can remove from play this card from your Graveyard as 1 of the monsters required for the Ritual Summon. If the monster Ritual Summoned using this card dest.. When you Ritual Summon a Ritual Monster, you can remove from play this card from your Graveyard as 1 of the monster required for the Riutal Summon. While the monster Ritual Summoned using this card is..